Reader Aaron sends in this picture of what we're guessing is one of the first unintentionally crashed versions of the untested and unreleased Suzuki Kizashi. The full story from Aaron below the jump. Knowing your connection to the unofficial "Save the Enzos" campaign, I thought you might be interested in this. 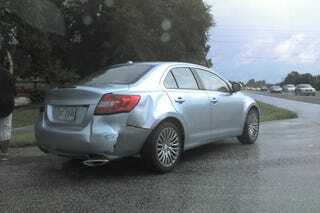 I didn't have a chance to grab a DSLR, but all I know is that a nissan altima driven by a fellow Full Sail stuent rear-ended this Kizashi in Orlando Rush Hour around 5pm today, 9/2/09. The accident occurred at the corner of Scottsdale Square (my Apartment complex) and S. Semoran Boulevard in Winter Park, FL 32792. The license plate read GEORGIA and DISTRIBUTOR. Hmm. Well, that's one idea.